Officials: Cold Temps "More Than an Inconvenience"
Officials on Sunday warned Chicago area residents to take the "dangerously cold" weather forecast seriously. "The cold temperatures we are expecting this coming week are more than an inconvenience," said Commissioner Bechara Choucair with the Department of Public Health. "They can pose a serious health risk." A Wind Chill Warning is in effect for much of the metropolitan area from 6 p.m. Sunday until noon Tuesday. Monday's high is predicted to reach -11, and morning lows could drop below -15 with wind chills as low as -40 and -50. As a winter storm continues to dump several inches of snow on the Chicago area, city officials say snow removal procedures will continue throughout the day and are running as planned. "The upcoming cold weather can be very dangerous and many homes will be very hard-pressed to stay warm," said Fire Commissioner Jose Santiago. Santiago urged residents to take extra precautions when using space heaters, like never using an extension cord and keeping space heaters at least 3 feet away from other objects. Choucair also warned residents to take "common sense precautions" like staying indoors if possible, avoiding travel, wearing layers and keeping your head, ears, nose, hands and feet covered when going outdoors. 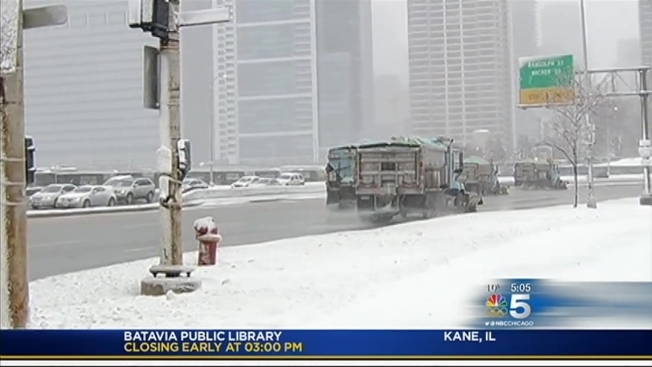 The Chicago Department of Streets and Sanitation also urged drivers to avoid traveling in the winter weather and be patient if out on the roads Sunday. "This is a good time not to be out on the streets," he said. Commissioner Charles Williams said the department is focused on plowing main streets, but is also ensuring side streets are "passable." The department, which mobilized more than 280 salt spreaders and plows Saturday night, will be "paying extra attention to streets around schools." Evelyn Diaz with the Department of Family and Support Services said Chicago's warming centers will be open extra hours Monday and Tuesday. The city's six community service centers and regional centers will double as warming shelters and will be open from 9 a.m. to 8 p.m. Monday and Tuesday. The Garfield Center at 10 S. Kedzie Avenue will be open 24 hours, she said. "We are pretty much pulling out all the stops," she said. 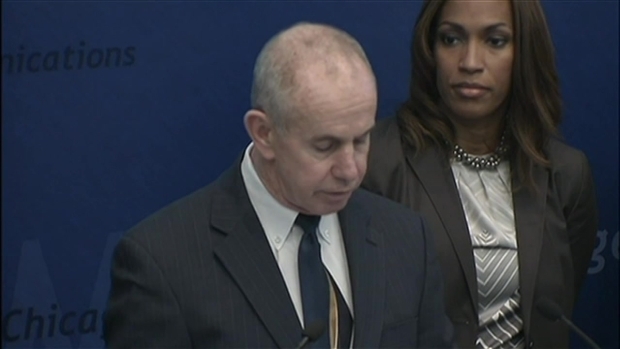 "We are going to take care of Chicago residents in this extreme cold. No one will be turned away." Officials said Chicago Public Schools will be open Monday, but noted students will receive an "excused absence" if they stay home. "One of the essential things in America is education and it’s an extremely important decision," said Gary Schenkel, executive director for the Office of Emergency Management in Chicago. "We’re leaving it up to the parents to make that final decision." For an update on school closings click here.